TagSEA  是好一陣子前看 ICSE paper  時發現的 tool, 當時就覺得蠻有趣的, 不過好像中文網站還沒有太多的介紹. 作者群在 ICSE 的那篇 paper 是 tool demonstration short paper, 應該蠻容易看懂的. TagSEA 網站上也可以直接看的到. 如其名, TagSEA 的主要功能在於能夠讓你隨意在程式碼上加上各種 tags. 有些是 TagSEA 已經訂好的 common tags, 例如 TODO tag, 而你也可以自定習慣的 tags. Tag 的位置可以在程式碼上, 註解上, 或是空白的部分. 加上 tag 的方式可以採用手動以 Java comment 語法加上 @tag 標籤, 或是直接在要註解的地方按 mouse 右鍵, 從選單中加入 waypoint (TagSEA 稱呼在 source code 中被標上 tag 的 location 為 waypoint). 在 waypoint dialog 中可以再指定要創造新的 tag 或是採用既有的 tags. 更詳細的說明在 TagSEA 網站上有很多易懂的 examples. 值得注意的是用 @tag 標籤加上的稱為 parsed waypoint, 而利用選單加上的稱為 resource waypoint. 這在後面製作 presentation tour 時會有差別. TagSEA 對於 waypoints 提供了 hierarchical tree view (上圖左下方), 以及有趣的 cloudsee view. 不過在右方的 tag message list 有點小 bug, 當新增 tag 時, tag message list 不會馬上更新, 需要等到再加一個新 tag, 或是 mouse 右鍵 tags -> show waypoints 才會更新. TagSEA 內的 waypoint 應該是沿用自 GPS 系統的稱呼 , 可以想見 TagSEA 其實定位自己是 Eclipse 上的 GPS navigator 系統. 因此同樣地, 數個 waypoints 以特定順序串在一起就形成 route (同樣來自於 GPS 系統) , 而一長串的 route 其實就是一個 navigation tour. TagSEA 也提供 Tour 的幫手功能 (但是需要 Eclipse 3.3 以上), 藉由 Tour 功能, 你可以快速地利用已經標好的 tags, 在 Eclipse 上建立一個簡單的 presentation (進行的步驟在 TagSEA 網站上寫的很清楚了). 只要執行編輯好的 Tour, 然後利用播放鍵就可以很順利地依照你的 plan 進行 presentation, 再也不用擔心 present 到一半卻忘了要開哪個檔案, 或是找不到要講的那段 code, 或是忘了本來要開的 view 是哪一個 -- 是的, Eclipse 上的 view 也可以作為建立 presentation tour 時的一的造訪點 (其他可以加的東西都在右側的 Tour Palette 上). 但是這裡要注意的是, 如果你要 Tour 自動根據 tag 換到該位置, 必須要是 resource waypoint 的 tag 才可以, 如果只是 parsed waypoint, 似乎 Tour 不會有反應. 執行後的 Tour 會在上方出現播放控制盤, 可以看到目前的位置, 也可以前後播放, 不過還沒有辦法直接跳躍到某個步驟. 可以看到當執行第一個步驟時, 畫面就自動切換到第一個 resource waypoint 所 tagging 的地點了. 另外除了 Tour Palette 上可以加的東西, 以及 resource waypoint 之外, PowerPoint 之類的也可以加到 Tour 裡面, 我嘗試了 OpenOffice.org 系列, odt 檔案可以, 但是 odp 就會出現一些顯示的問題, 不過這些問題應該跟 TagSEA 無關, 是 Eclipse 本身的問題 (OpenOffice.org 會直接以 OLE 物件的方式開啟在 Eclipse 視窗內, 而 PowerPoint 會獨立開啟), 我也嘗試了 PDF, 但是會出錯, 根據錯誤訊息應該是我 local 端的設定問題. 換句話說只要你 local 端有相對支援開啟的 software, 應該都可以順利在 presentation 過程中開啟. 下面是開啟 odt 檔案的樣子. 從 tool 的角度來看, TagSEA 算是蠻小巧好用的 tool, 而我喜歡他的另外一點是, 從 research 的眼光來看, 這個小 tool 有相當大的潛力. 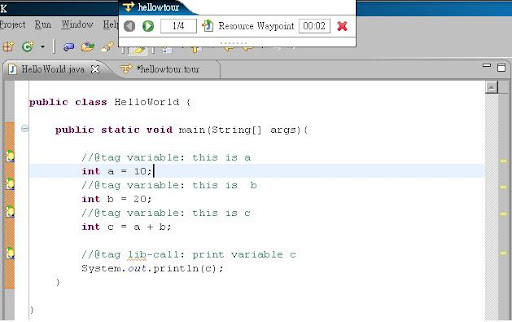 現在 TagSEA 只能在 code 上加 tag, 而別忘了 Eclipse platform 上的 plug-ins 幾乎快涵蓋了整個 model-driven software development, 雖然有些 plug-ins 還不算太成熟, 但是當 TagSEA 可以更順利地支援直接在 use case, object model, analysis model, architecture design, detail design 上加註 tag 時, 想想他將會有的 power, 給 software developer 提供的 traceability service 以及 consistency checking service, 還有很多可能的應用, 都可以建立在這一個看起來很簡單的 tool 身上去實現. 我想這是包含我在內的許多台灣研究學生, 經常忽略的一點, 在我們手上的許多小想法因為他們簡單, 所以擁有更大的發展空間, 老想著重新作出全新的東西, 會讓我們的研究工作前進的十分緩慢. 好好地利用已經有的東西, 往上堆積新的價值, 才是一直以來研究該有的方式. This entry was posted on 下午9:35 and is filed under Eclipse , IDE , software maintenance . You can follow any responses to this entry through the RSS 2.0 feed. You can leave a response, or trackback from your own site.